The new film by Australian-Greek filmmaker Bill Mousoulis is an unusual experience. It’s not a conventional documentary on music, and it’s not a musical that looks to materialize songs of anger and deception. Mousoulis goes beyond and proposes an eclectic mise-en-scène which oscillates between the uncertainty of being or not in front of fictionalized moments in a film of documentary spirit. Songs of Revolution is a compilation of Greek protest music. 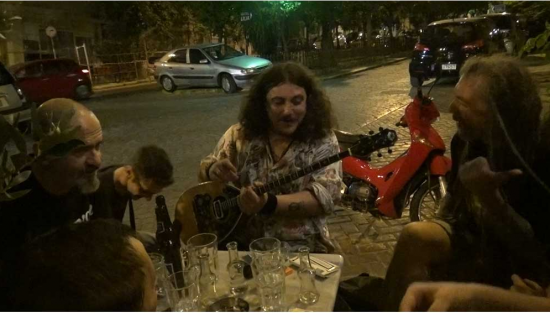 We hear testimonies of its main exponents, such as Antouan Parinis, Dimitris Poulikakos, Thanos Kois, or bands like OUST!, Alpha Bang, o Social Waste, that range from folk, punk, hip-hope to traditional rhythms suchs as remetika, all of which allow to discover the different sides of the musical scenes, all of them intercepted by recreations or dramatizations in a video clip manner, performed by actors that simulate being the singers or original musicians. Thus, what Mousolis achieves is precisely the description of a sensibility, which has always depended of political and social contexts that ruled Greece, from the sixties, for example, to today. Mousoulis starts Songs of Revolution with a contextualization of this Greece in crisis that we know from his previous work, Wild and Precious (2012), which forms this current ideal ambience for complaint, boredom and rage that the song lyrics describe. Then the interviews to old glories of music, reunited with younger musicians, propose a sentimental structure that hasn’t changed. The dissatisfaction for a conservative social and economic system that infringes upon them seems to be the same over 50 years. However, Songs of Revolution doesn’t stay in this first stage of social and political unrest that all protest songs has, but also requires starting the mechanics of this unconformity, that is not only in the concert or the testimonies of singers and musicians. The filmmaker appeals to give another meaning to this sentimentality of music as a transformative being, that’s why the lyrics not only talk about the social crisis but also how this crisis has changes the ways of how the familiar, friendship and amorous environments are related to each other. Thus, an old cliché on the protest song as an only political grievance is subverted, and shows its role in the transformation of more complex common senses about love, death and solitude. Songs of Revolution shows Mousoulis’ fine creative state, and gives more clues on the current Greek soul, especially among a traumatic economic crisis , than any other contemporary documentary or fiction film.